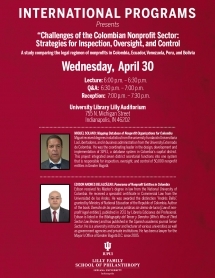 Solano and Belalcázar's presentations will focus on a study comparing the legal regimen of nonprofits in Colombia, Ecuador, Venezuela, Peru, and Bolivia. 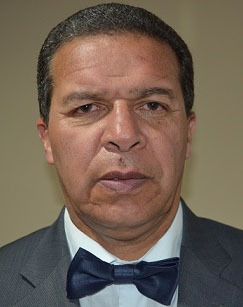 Miguel Solano has received degrees in statistics from the university Fundación Universitaria Los Libertadores, and in business administration from the University Externado de Colombia. He was the coordinating leader in the design, development and implementation of SIPEJ, a database system in Colombia's capital district. This project integrated seven district secretarial functions into one system that is responsible for inspection, oversight, and control of 50,000 nonprofit entities in Greater Bogota. Edison Andrés Belalcázar received his Master's degree in law from the National University of Colombia. He received a specialist certificate in Commercial Law from the Universidad de los Andes. He was awarded the distinction "Andrés Bello", granted by Ministry of National Education of the Republic of Colombia. Author of the book: Derecho de las personas jurídicas sin ánimo de lucro [Law of non-profit legal entities], published in 2011 by Librería Ediciones del Profesional. Edison is listed in the Bibliography del Tercer y Derecho (Who's Who of Third Sector Law Review) and has published in the Spanish academic journal Tercer Sector. He is a university instructor and lecturer at various universities as well as government agencies and private institutions. He has been a lawyer for the Mayor's Office of Greater Bogota D.C. since 2005.